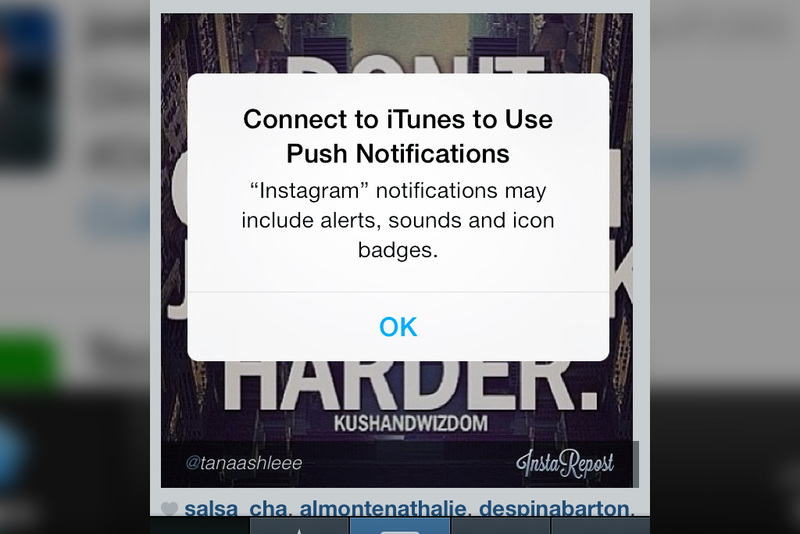 Ever since updating to iOS 7.0.3, my iPhone kept telling me to “Connect to iTunes to use Push Notifications”. Connecting to iTunes did just nothing: the notice kept popping up. Additionally iMessage and FaceTime didn’t work anymore, really annoying. Above that the notice forced some apps in a loop as an app would lose and regain focus with that dialog showing (Dropbox with a passcode for example would get stuck in such a loop). Not that handy. Go to “Settings” → “iTunes & App Store” and log out of your account. Go to “Settings” → “iTunes & App Store” and login again. That should do it (at least it did for me). Did this help you out? Like what you see? I don’t run ads on my blog nor do I do this for profit. A donation however would always put a smile on my face though. Thanks! tx a lot. it worked. I am on my iPhone 4 on the latest ios and after disconnecting me from my wifi and signing me out of the youtube app I signed back into both and keep getting this popup I hit OK but it keeps happening over,and ovER,and OVER!!!!!!!!! I tried this fix and it STILL WONT WORK!!!!!!!!!! not working unless step 2 Restart your iDevice using power and home buttons. I keep getting in the YouTube app even after I tried this. Is it because I am on IPad? It worked for me too! Many thanks! It worked for me ! Many thanks! Thanks, it worked for me on my jailbroken iPhone 4, running iOS 6.0.1. It worked for me too. Thanks! In fact, it even speeded up most of my apps and reduced the crashes I was also experiencing. I do not know what this issue affected (and how), but this is now solved. Worked for me to…..Thanks bro…….. Yes, this worked for me, THANK YOU so very much! It’s been so very frustrating to get these messages when I log into Facebook and Pinterest on my iPhone. Hopefully this also corrects the problem I’ve been having sending imessages. just restart your mobile no need to log in log out. WOW i cant believed that worked. i thought it would have been way more complicated to fix. Thanks! didn’t work for my iphone 4s! I’ve tried everything, from resetting all network settings, to restoring the iphone and nothing has worked! I have fixed the problem on my iPhone 4S yesterday. No reset, additional software or anything. Just a simple setting… I posted the solution on the Bram.us page. Please check it out and let me know if it also works for you. I was able to solve this “connect to iTunes to use push notifications” problem in iOS8 after trying a lot, but not resetting and restoring my iPhone 4S. The action that gave me a solution was switching off Background App Refresh (under Settings –> General). Later on, I could switch the function on again. The problem did not return. Neither worked for me on a 4s with iOS8. Where will i see it?? Finally, tried all of the above with no luck and this worked! Thx! This helped on iPhone 5 with ios 8, but I had to make a ‘hard restart’, ie press home and power button for several seconds until it powers off. Worked for me as well! Thank you! It worked! It worked! I was sure I’d be going to the Apple store tomorrow-ugh. It fixed the error message that was keeping me out of all apps, and it fixed my texts not going through. Thank you soooo much! Worked perfectly for me. Thanks! Yay – All is well in the world again! Worked great! thanks a million- your fix worked!! That drove me crazy for a week!! Yes it did work for me, thanks a lot. This hasn’t worked and I’ve tried everything! 🙁 has anyone else got anymore suggestions? I’m getting annoyed now! did not work for me either…. It worked on my IPad! You MUST remember to restart your device! Thank you so very much for the fix! So easy!! Finally…a fix that worked!!!! Thank you so much!!!!!!! Thank you very much. This did work for my iPad. Pingback: iPad 2 iOS 8.2 Reviews: Should You Install iOS 8.2? Finally worked. Thank you for this solution. It was extremely annoying! Some warning though: the first two times the solution did not work. Then i tried the one from SirPeet (November 19, 2014 at 9:42 pm) which didnt seem to work either. Then i tried	zlody’s solution (February 13, 2015 at 2:51 pm) which also didnt seem to work. Then i started over a couple of times with Bramus’ solution followed by SirPeet’s and Zlody’s. And suddenly…..succes!!! So the moral of this story is to try a couple of times before giving up. The given solutions might not work at once. Btw….when it finally worked i received a notification asking me if i was sure i wanted iMessage on cause my network provider might charge me for that. Weird because i didnt touch iMessage (as far as i know). I was only alternating between the solutions above. Now, im dont know if the iMessage thingy has anything to do with the push-notifications problem but if the given solutions dont work you might try to fiddle around with iMessage a bit. Could well be related. Perfect! Many thanks….thought I was going to have to call my 22 year old for help, again! I installed the 8.2 upgrade on my iPad and have tried all these solutions and nothing fixes it. Any ideas out there? I really don’t want to reset my iPad. This solution worked after installing 8.2 on my iPad. Thanks! My 4S with IOS 8.1.3 is constantly giving this push notification issue with nothing working. Please help Apple! OMG. All the other suggestions didn’t work for me, but this one actually worked for me.! Thanks for sharing! This was driving me nuts!!! On IPad…. None of the above suggestions work… Any more ideas? THANK YOU! Was this close to chucking my phone against the wall! Thank you so much. Fantastic! It’s worked for me too. ipad3 on ios8.2, problems with dropbox (totally unusable because of the loop). The solution fixed the problem!!! Thanks. Thanks, it is worked woth me ! Holy crap it really worked! Thank you so much! thanks a lot! it works for me! I can’t believe this error is still happening. I think it started after I updated to iOS 8.3 on iPad. Your solution worked like a charm for me, thanks! Thank you thank you thank you! It’s been paralysing my phone for the last few days! restart from where? to switch off the Idevice and On it again or how? This worked for my ipad3 after the 8.3 update. . Thank you! Thank bloody goodness, it actually worked! A reminder that restarting the phone means holding both sleep button and home button down til the screen goes dark and apple logo comes on immediately. Imessage charges message will show up, showing that the ordeal is over!! Thanks a lot! It worked. Is that ever retarded! Apple! Fix your sh*t! Doing Settings > ITunes & App Store then log out and restart then log back in really worked! Thx a ton. All good now for my Iphone 4S! thanks everyone for sharing! why I still can’t fix this problem even though I have follow all your steps? 2015 and it still works!! Even though having the latest ios, this has been driving me nuts lately. Thanks much!! You are a genuis! Yayyy it worked on my ipad3. Thanks a lot. After trying all the above suggestions and this annoying push-notif bug still pops out. It worked, but not until I did the restart by pressing the home and sleep buttons (before I have just be powering the phone off). Thanks! it worked. just keep repeating the steps because it didn’t work in my first try, but with the second it did so keep trying and repeating. thank you again for posting this. It worked for my iphone 5c 8.4.1. Very simple but perfect result. As many people here, it didn’t work on my first time. When I tried again, the error was fixed. Many thanks to you!! Yay! It worked. Thankyou! I was really pissed. I almost throw my Iphone because of that notif. Btw thanks. A lot. Hi thanks for helping here !!!! Worked after the second try! For me, it had to be the home + power buttons together kind of restart. The off-on didn’t work. Worked for me (iPad 4, iOS 8.2). It worked for me also……. It’s worked. Thanks a lot. I’ve to tried 2nd time. absolutely, very realistic, it fixed my problem, i.e; “connect to itunes to use push notification”, but i had to repeat this process twice. Worked on iphone 4s using ios 7. Thank you very much.